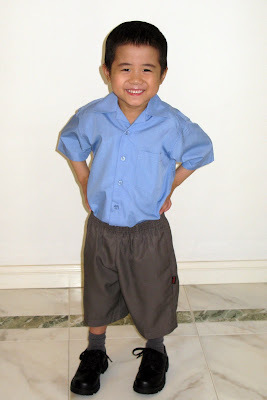 Jeremy's first day of School! Today, the four of us headed up the road to school - Stephanie and Jeremy were both very excited and ran up the hill. We were early enough for both kids to have a run around the playground, and for Jeremy to try out the big boys urinals. Jeremy was most impatient and didn't want to wait around at lines - he dragged Mummy down towards the K-2 building. Eventually, it was time, and he got to go inside and meet the assistant principal for infants, and then made it into class, where he sat down at the play doh. He was happy when we left the room, and apparently had a great day in class. We are thankful that he has the same kindy teacher that Stephanie had, as he is familiar with her when Mummy and he used to help out with reading for Stephanie's class. He managed to find his sister during morning tea and lunchtime, so it really seems he feels quite comfortable at school - I am sure these kindy kids take some time to make their own little friends. When we picked him up at the end of the day, he proudly showed us all his craft and told us that he had been "working hard". Then he and BaBa went to the shops to buy his favourite drink - of which he had been deprived for 6 months because of his food regulations - a giant slurpee, which he shared with his sister when she finished school. And tonight, they made a spicy chicken mix and ate baked chicken wings with gusto - this time, he actually ate the chicken meat and not just the crunchy skin. To watch our 2 children walk home together after school was just a brilliant feeling. That they looked like any other ordinary school children was an added bonus (though they will never be ordinary to us). We are ever so thankful for the miracle that Jeremy has received, for the daily joy of playing with him at home, and for the unexpected blessing that he could start school earlier than anticipated! What wonderful news - how exciting for him to be at school. What a blessing! Good luck to Stephanie and Jeremy at the school !! !